Here we are. The great blue bowl of September skies covers us in the afternoons. The first day of this month was a great day to pile 6 adults and 2 children into the boat and take a short ride to Sidney Island for a day of sun and sand. Together we walked along the wooded trail to the walk-in campsite, then circled around to the other side of the small island, took steps back down to the beach and meandered back along the sand. Water + sticks + sand + children = unending entertainment. Sticks and sand also provided entertainment for our son, who found this pointy-headed creature and thought he needed sunglasses. Not even a hint of wind ruffled the tidal pools in the morning. Calm waters and perfect reflections hint at the resignation of summer's soon end. Meanwhile, we soak in the sun and delight in the thought of cooler nights. 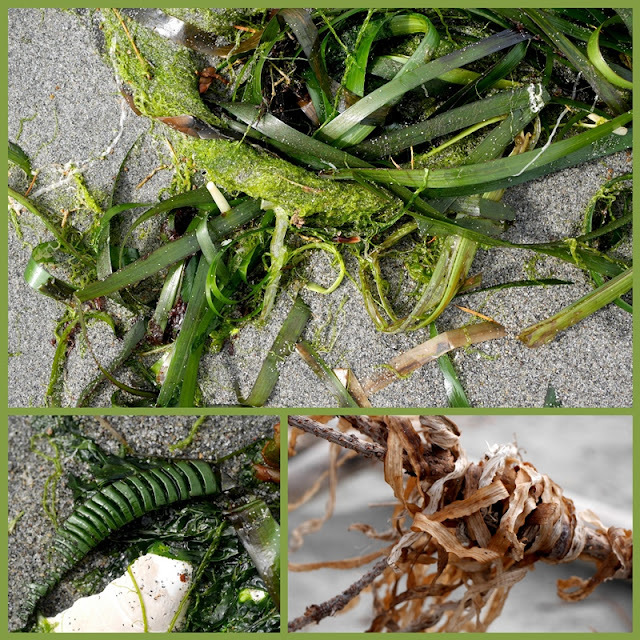 Eel grass is thrown up by waves onto the beach to dry and tangle, or be caught by a rising tide and tossed back into the sea. An indomitable blackberry plant grows from an old stump, surviving hot days with no rain. Loving this perfectly illustrated poetry collection! What a beautiful way for all generations of your family to celebrate the end of summer (which it really is when school starts, even if the calendar doesn't say so yet). An island beach is a perfect place to see beauty (and humor) with the eyes of a child! And to be astonished. Thank you for telling us about it -- for letting us share in the astonishment. Hi Lorrie, You are surrounded by so many areas of natural beauty! "Great blue bowl" is a perfect description of the September sky -- just one of the reasons why September is my favorite month. :) I love your picture of the big rock reflecting in the tidal pool. This looks like a fun outing for all ages; it's important to take advantage of those opportunities to go and to see, isn't it? Thank you for sharing, Lorrie -- hope you have a great week! Your son has a fun imagination...wonder where he got that from. How artsy the blackberry bush growing in the old stump...something one might see in a garden not out in nature. Oh the beautiful blues of that scene... Happy September, Lorrie! That companion to your sun, with the shades on, looks quiet realistic. Sounds like you really are soaking up the last days of summer! Your weekend outings are always so interesting. Beautiful photos! Enjoy your first days back at school! Beautiful images of your outing. Happy Mosaic Monday! Lovely. Thank you for starting the day out with a smile. The quotes are words to remember. Your son's kind and cheerful smile is precious. Enjoy the remainder of summer. We are welcoming spring here - my favourite time of year. Have a fabulous week. I am joining you at Mosaic Monday. A wonderful day together to mark the end of summer and the start of another school year. Your son & his friend made me smile and the reflection photo is lovely. Thank you for taking the MM crowd out for an astonishing day on the boat with you this week. Love, love those lines of Mary Oliver's ... pay attention, be astonished, tell about it. Lorrie, you are marvellous about doing just that. Your photos are so alive with life and wonder. The sunglasses-wearing pointy-headed creature made me smile. Enjoy the last day of the long weekend! Keep those beautiful skies coming please Lorrie! All looked lovely for your weekend sail with the family - and of course Mary Oliver's quote is perfect! Thank you for Mary oliver, not some one that I knew of. Always such beauty in your photos. Beautiful and fun post, Lorrie. Love that creature with the sunglasses. Also enjoyed all the quotes! You always find beauty in this wonderful world, Lorrie, and it seems you've passed that gene along to your offspring. Happy September! Yes, that sky is pretty wonderful. It doesn't look quite like the color I've been seeing lately here - but that might be because of smoke in our air. Lorrie, The best in the world. Family, sun, and time to enjoy the outdoors! Have a great week. Sylvia D.
It looks like a delightful day at the shore with your family, Lorrie. The photo of you son and his wooden "friend" made me chuckle! We are fortunate to see blue skies like these almost daily--especially now that the smoke for the western fires has finally blown away. Lorrie - I love your quotes in this post … I was trying to choose a favorite, but I simply can't - they all speak so wisely about the relationship that we should have with the earth and every moment on it. Thanks for sharing them, and the ideal photos to illustrate them. A lovely post...the poems and the photos! Your photos grabbed my attention - the words and your images sum up beautifully what has been such a lovely summer season this year. Summer may still officially be in charge, but Fall is edging her way in. The mornings are cooler now and the children are all back in school. I enjoyed you day on the water--great photos, good family time, sweet memories for your family, lovely photos and inspiring words for your readers to enjoy. Such a lovely post, loved seeing the two young children and your son with his wooden friend - love those sunglasses! The reflections in the tidal pool are amazing. Such a lovely post with beautiful photos. I especially love the big rock and it's reflection! A beautiful family outing indeed, Lorrie, lots of beautiful lasting memories were made. Such a nice way to end summer. Thanks for sharing. What a wonderful family escape. Your son has your eyes. How lovely to have this time with family. I love that photo of the plant in the old stump! Makes you want to take it home.